I am at a conference for the rest of the week. Workshops begin at 8:30 AM. Working backwards, this means I must be up by 5 AM to get washed and dressed, eat breakfast, drive to the training site, set up the workshop room, and be ready to greet participants (without a bleary eye) by 8:15 AM. Upon reading my statements, early morning risers will think, “What’s so strange about that?” But for those of us who were meant to keep Regency hours, this schedule is akin to torture. I would much have preferred Jane Austen’s hours. How the English during the Regency era spent their mornings depended on their status. The schedule of the modern day trainer or worker is, in fact, one that a servant in the 19th century would have kept, rising at dawn to haul and boil water, stoke the fires, and get the house in shape before the gentry arose. Unlike 19th century servants, modern day folks generally eat breakfast before the workday begins. Servants, who had been toiling for at least 3-4 hours making the house ready for the day and tending to the family’s needs, would not break their fast until after the family’s breakfast dishes had been cleared and rinsed. Mrs. Bennet or Mr. Knightley, both country gentlemen, would rise earlier than their city counterparts, who kept later more fashionable hours. Upon rising at 7 AM, Jane Austen, for example, would not immediately sit down to breakfast. She would write letters or practice on the piano, walk in the garden to pick flowers, or even go into the village to run a short errand before sitting down with her family at 9 AM to partake of a simple breakfast consisting of rolls, breads, butter, preserves, and tea or a pot of hot chocolate. If she were on vacation or at the seaside, she might take a leisurely stroll to the beach or point of interest before partaking of the morning meal at an inn. Lady Bertram, whose day revolved around pleasing herself, would in all likelihood arise from her bed much later than Jane and remain in her dressing room with her maid until she was suitably dressed. Before breakfast, she would also consult with her housekeeper about the household plans for the day, giving her instructions to relay to the cook about the day’s meals. She might write letters in her boudoir and emerge in her morning gown and cap to eat breakfast with her family, or perhaps have it sent to her rooms on a tray. Sir Thomas Bertram or Mr. Knightley would also delay breakfast. They might consult with their bailiffs, or check out a new horse at the stable before consuming their morning meal. 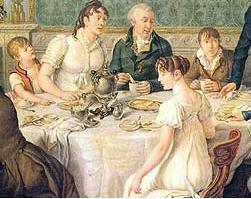 General Tilney stuck to a strict schedule and had the family eat breakfast at nine. The Middletons, whose house was always filled with guests, ate breakfast at Barton Park around 10 AM. Some families sat down together, while others strolled in during a certain set time, say between 10 and 11 AM let’s say, to help themselves from dishes placed on a sideboard. 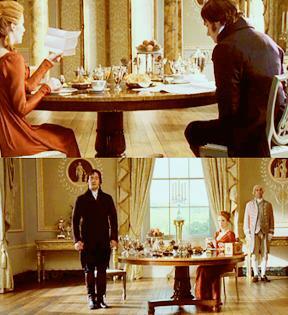 One imagines that the Tilneys observed the former practice, whereas Mr. Bingley and the Middletons allowed people to wander into the breakfast room at their own pleasure. Edward Austen Knight, Jane’s rich brother, had breakfast served at 10 AM, and expected the entire family to be at the table. By 11:30 AM, breakfast service was generally over. Town times were much different, and meals were served at a later, more fashionable hour. Often the very fashionable would stick to those hours even when in the country. Lizzie Bennet walked 3 miles to Netherfield Park after breakfast to be with her sick sister, Jane, only to encounter Mr. Bingley’s town guests just sitting down to breakfast over an hour later. The Regency definition of morning differed vastly from ours. Visiting hours were kept at set times. A family might receive visitors on Tuesdays and Thursdays, for example, or on Wednesday, between 11 AM to 3 PM. These hours were considered morning hours. When Anne Elliot arrived at Uppercross Cottage at 1:00 PM, she considered the time to be early in the morning. 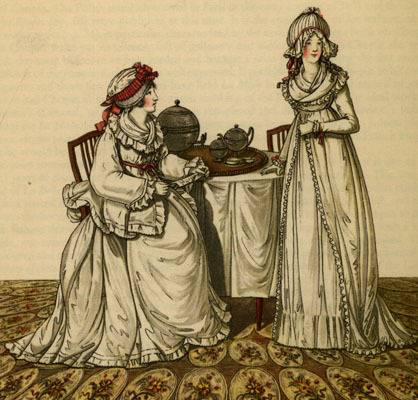 Regency ladies wore morning gowns when they were at home. If a lady had no plans to go visiting or receive visitors, and simply stayed at home, she would wear her morning gown well past the hour of three, not bothering to change until dinner, when she was expected to dress more formally. Morning gowns could be made of simple dimity gowns covered by a pinafore if the lady, like Elinor Dashwood or Cassandra Austen at Chawton Cottage, was working in the kitchen or garden, or the gown could be made of finer stuff, like a delicate muslin. Ladies in morning gowns could be seen by family and guests, but they would never dare set foot in public while wearing one. I must admit to liking Regency hours. On the weekends or on vacations, I rise late and will lounge for hours in my study/dressing room, reading or writing for my blog while sipping coffee. I’ll throw on some clothes and walk my dog Cody, and afterwards will make breakfast. I’ll then hang around the house in my ratty lounge wear, doing a little of this and a little of that, before donning more respectable garments to receive visitors, go out and shop, or visit with friends and family. If I am home all day, I’ll stay in my frayed jeans and tee shirt. Would that my daily schedule resembled my weekend schedule! But, alas, I must work to earn my dog’s kibbles. The clock tells me I must get dressed now and be out of the door in half an hour. The powers that be decreed that our work day starts anywhere between 7 and 9 AM (even earlier for many). Obviously, considering those hours, our bosses view us more as servants than as revered guests. I, for one, was meant to be a lady of leisure. Perhaps I shall be reincarnated as one? I rise around 5 AM most mornings and try to get as many chores out of the way as my health will allow (CFS/fibromyalgia — so I run out of steam early). While I am doing that, my elderly Bichon slumbers on. He may wake anytime between 9 and 11, at which time I take him out for his morning constitutional, give him his breakfast, and then resume whatever I was doing while he selects a prime location for his next nap. My “morning gown” consists of comfortable ratty clothes as well, which are best for accomplishing whatever chores I can accomplish. I don’t dress up any more unless I am either expecting company or going out. But I do keep early hours at night. I have to admit that dealing with a health issue like mine makes for early bedtimes and lots of reading. I have a dear friend who keeps Regency hours. It’s very frustrating sometimes because I’ve put in half a day’s work before she even gets up! At 5 a.m. I might think of something I’m eager to tell her, but I can’t call her until 10! I’m not saying my way is better, just that being out of synch is sometimes a problem. Right now I’m eager to tell her that her routine has the pleasant sounding name “keeping Regency hours,” but she won’t be up for hours! Lovely post! I’m with you, I’d much prefer the morning hours of Regency life than the ones that are required of me in real life. Thanks Vic, that’s why I keep having trouble with my plot timelines. I’m forever trying to shoo people out the door to find that essential clue, but I have my ladies scribbling their letters, drinking their chocolate and forever changing their clothes, all the while Lord Insidious is hatching his dastardly schemes. By the time they get out the door it’s already 1 p.m. Half the day is shot, or so it would seem to me, a hurried modern tourist in the Regency world. And perhaps it is the movies that make me think this way, but I always imagine Emma getting an earlier start on the day. After all, she’d need enough time to mollify her father, spar with Mr. Knightley and get her good works done before spending however long it takes with the Bateses. I vote for the regency hours…as long as I was gentry and not a servant! Perhaps some of the hours have to do with the season. England is really far north, so summer days last till 9 or 10pm. While in winter, what sun there was, appeared from 9am to 3pm. I recall in one book I read that the author made sure to point out that the windows were covered in heavy velvet so that our Regency heroine could sleep late. So glad that I’m not a servant, oh, make that slave. Bad enough to “serve” our current household…and I find that I get up early to enjoy that one hour of quiet! This was great and very enlightening. I think most American’s would be shocked to read this as most live to work. Regency hours so much more pleasant than the hours my job requires of me. It is greatly appreciated by me and didn’t even know it that I was keeping regency hours. Two things also are worth remembering – first, that local time was always exactly in line with the daylight so that every town and village from east to west kept its own individual time: ‘standard’ time didn’t come in until the railways arrived in the 1840s – second, that it was quite laborious and expensive to illuminate the hours of darkness, so that the best use had to be made of daylight hours, especially in winter. It was only the rich and careless who could afford to live it up during the dark hours! But it is also worth noting that by the Regency period time was quite accurately measured – I have a long-case clock that has been in my family since it was made in 1797 and it still keeps time to within a few seconds a week! I am definitely a fan of regency hours, though the school system I teach in is decidedly not. According to the regency definition I teach all morning and then have all evening to play. Not so, as I have to rise as a servant to be ready to teach again. And, given that they are 7 & 8 year olds, that means that they are bright and raring to go at a servant’s hours! I love keeping regency hours but could not keep the mealtime. I’m so hungry when I wake that usually that is why I roll out of bed. If I were a regency lady I would have to have a stash of raisin bran for a little snack, then deal with the housekeeper, go for a walk, and eat the normal ‘breakfast’ with the family being none the wiser. (except for my maid who would have to bring me some milk). I, too, am a Regency lady of leisure, ensnared in a servant’s schedule! I knew there was something off-kilter! This was a fun article, Vic. Thank you! Thank you all for your revealing comments! And for overlooking my many mistakes. Obviously I wrote the post in haste before going to the conference, and I appreciate your kind attitude towards my terrible grammatical faux pas, which, by and large, have been fixed. I’ve read a little about Regency mealtimes, and had some trouble understanding, as the writer would usually waffle about it. Your explanation is very clear. I’d like to read what you’ve written about local time, as Andrew mentioned, and you commented on, but I wouldn’t know how to search your site for it. Would you mind giving a link, please? Thank you, Vic; I always enjoy your well-researched blog, even though I don’t respond very often with a comment! From 1792, in England, it became normal to use local mean time, rather than apparent time from a sundial. In the early part of the 19th century, communications started to be significantly improved, the railways started to be constructed, and “Galvanic Communication” (Telegraph by wires) started to become common. Thanks for adding that, Vic. That was fascinating. The legal implications for inheritance had me thinking. Someone could write a novel with this as the plot device. I appreciate your help. These are VERY interesting links, (so far) and I will enjoy spending more time getting into them. It’s something I’ve wondered quite a bit about, since our world depends SO much on what time it is! As I said, I’m a morning person, so I would have had trouble with being a Regency LADY — and I CERTAINLY would not want to be a Regency Servant! When Daylight Saving Time begins and ends, it wreaks havoc with my internal clock, but just going by a sundail would be lovely! I believe I could have happily lived THAT way! Did you see the part about a “moon dial” — interesting stuff, thanks again. Did YOU write more about this here on your blog somewhere? Cathy, in terms of local time, I did not write a post about this fascinating topic. I will, however, talk about it in the future. I guess I was destined to be a servant, preferring the early morning quiet, both inside and out. I do like to make the most of the daylight hours year round, and don’t care to stay up until the wee hours of the next day, so never would have fit into the quality’s round of parties during the Regency era, though I do love lingering over the morning coffee. Have you noticed how our summer hours shift with daylight? I rise earlier, and join in outdoor activities later. My hours would be more affected in winter than summer! I keep Regency hours. My brain doesn’t function before noon. It’s one of the only good things about being a student with evening classes. I dread the working world. Morning during the Regency was defined just as it had been for centuries before. 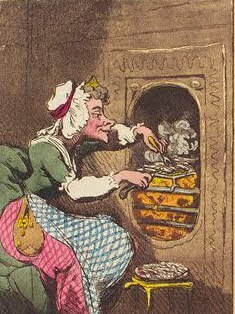 Morning was the time between when a person awoke from sleep until the main meal of the day, known even during the Regency as dinner. It was not until after the advent of the railway that people began rethinking time and morning was then defined as the twelve hours from midnight to noon.